No time to fuss for Easter, but want something to make things special. Try this easy, quick, and fun idea. 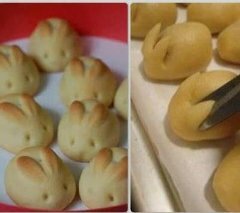 Use any sort of frozen or homemade bread dough, form your rolls, snip and lift/shape the ears during rising and carve the eyes once baked! Brush with Garlic Butter and sprinkle with sea salt for the perfect accompaniment for your ham.